Inspiring a Safe and Healthier Day-to-day Lifestyle for the Ones We LOVE! Did you know that June is National Safety Month? During this month, a heavy focus is placed on preventing slips, trips, and falls. Falls are the second leading cause of accidental death. This really hits home for me because we faced a recent experience with my 93-year-old father in law. My father in law is turning 93 years old in September. He lives alone in his home and refuses to live in an assisted living for seniors so we make sure to visit every chance we can. He recently fell and passed out but luckily my niece in law and her family was there to help him. His head was bruised and his fingers were swollen after a day and then a couple of days after his fall, his let eye turned red. We encouraged him to go to the hospital to get checked but her refused. He hats hospital. Hubby and I worries about him a lot because at his age, his bones are brittle so even a simple fall could really hurt him badly just like what happened. At his age, he realy craves for some company and we feel so bad that we can't be there every single day. We asked him to live with us so I can take care of him since I am a stay at home Mom but he doesn't want to do that either. Advance happy Father's day Dad and to my husband. They are both loving Dads! Below is a related article submitted by Ms. Judy Cohen, the Outreach Coordinator at the American Recall Center. You may visit the links for additional info on how to help your senior love ones. The American Recall Center created a graphic that outlines how to prevent the ones we love from taking a fall that may cause traumatic injuries. The most common injury induced from falls is a hip fracture that often leads to a hip replacement surgery. These surgeries are becoming more and more popular, but there are still risks associated with the many recent hip replacement recalls. Sadly, 25% of those who fracture a hip die within 6 months, making it increasingly more important to educate on the prevention of falls. 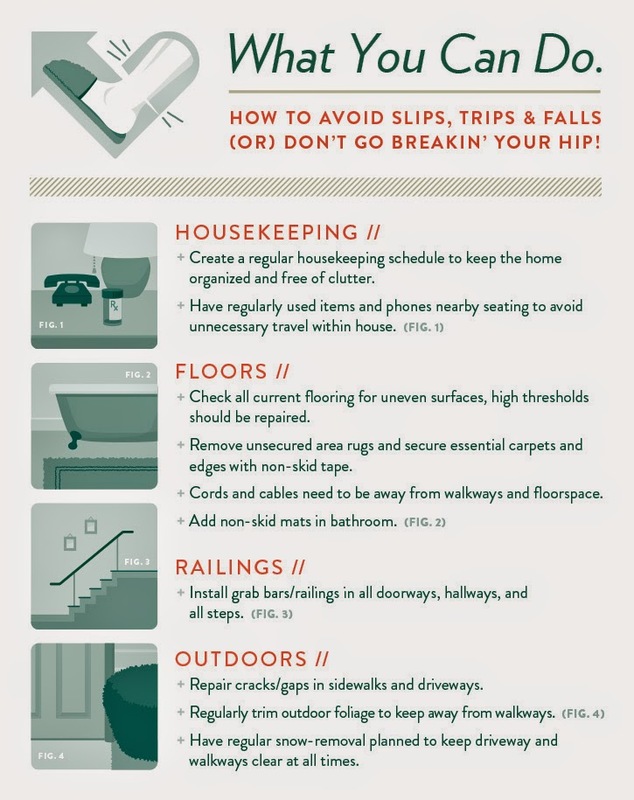 I encourage you to take charge of your health and educate the loved ones in your life on the importance of taking preventative action against slips and falls.